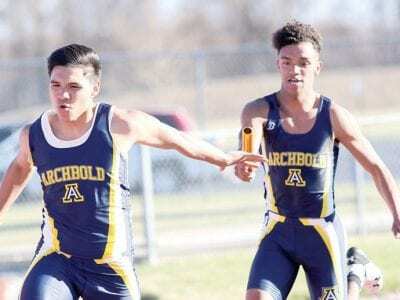 Noah Gomez, left, reaches back to take the baton from Antonio Cruz in the 4×100, Tuesday, April 9. The AHS boys won the race.– photo by Mary HuberLiberty Center won both the girls and boys meets in a … Sorry! This content is only available to paid subscribers at this time. Please login below, or consider purchasing a subscription today! 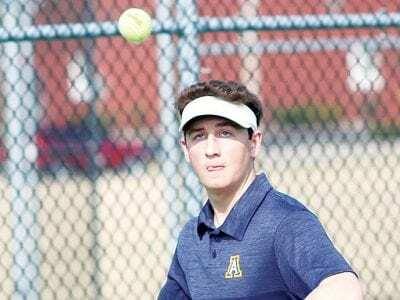 Andrew Hogrefe keeps his eye on the ball to return serve. He defeated opponents from Maumee Valley Country Day and Bluffton last week.– photo by Mary HuberArchbold defeated Maumee Valley Country Day a… Sorry! This content is only available to paid subscribers at this time. Please login below, or consider purchasing a subscription today! 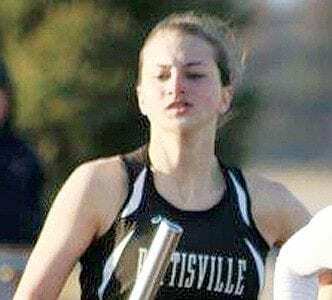 Sarah Foor runs the 4×400 relay for the Birds.– photo by Beth FoorThe Pettisville girls track team won a tri-meet with Holgate and Fayette, Tuesday, April 9, at Pettisville. Girls Pettisville 53, Holg… Sorry! This content is only available to paid subscribers at this time. Please login below, or consider purchasing a subscription today! 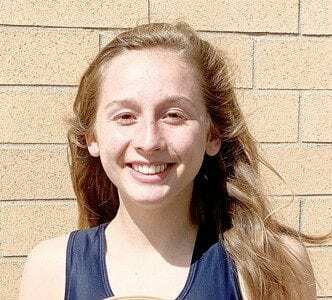 The Pettisville girls track team finished sixth and the boys were 10th at the Joe Tussing Patriot Invitational, Saturday, April 13, at Patrick Henry. Girls Kalida 98, Leipsic 83, St. Marys Memorial 8… Sorry! This content is only available to paid subscribers at this time. Please login below, or consider purchasing a subscription today! 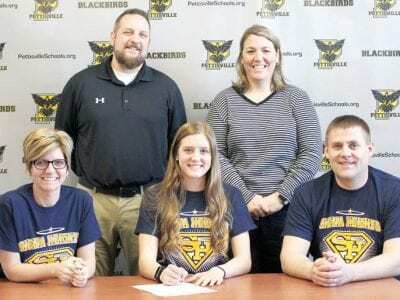 Morgan Leppelmeier, PHS ‘19, seated, center, signs a letter of intent to play basketball at Siena Heights University, Adrian, Mich. Seated with her are her parents, Amy and Brian. Standing are J… Sorry! This content is only available to paid subscribers at this time. Please login below, or consider purchasing a subscription today! The Pettisville baseball team dropped two nonleague contests last week before winning their first game of the season to stand 1-6 on the season. Holgate 8, PHS 5 Tied at 3 after one inning, Holgate (… Sorry! This content is only available to paid subscribers at this time. Please login below, or consider purchasing a subscription today! The Pettisville softball team split two games last week, falling to Holgate but winning its first game of the season in a 20-19 slugfest over Emmanuel Christian. Holgate 13, PHS 1 The Tigers visited … Sorry! This content is only available to paid subscribers at this time. Please login below, or consider purchasing a subscription today! The Ohio High School Athletic Association announced changes to the 2020 individual wrestling and girls basketball state tournaments. The state wrestling tournament will move to a Friday Saturday-Sunda… Sorry! This content is only available to paid subscribers at this time. Please login below, or consider purchasing a subscription today! 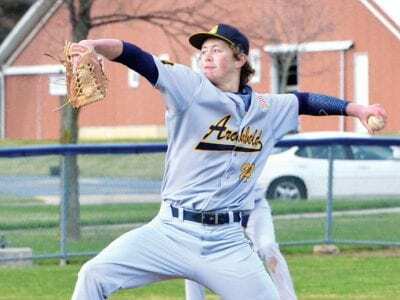 Aiden Warncke got the win on the mound when Archbold defeated Swanton 11-3 for its second NWOAL victory of the season, Thursday, April 11.– photo by Mario GomezThe Archbold baseball team is on an eigh… Sorry! This content is only available to paid subscribers at this time. Please login below, or consider purchasing a subscription today!